The Sierra Nevada Winds Orchestra, composed of 45 brass, woodwind and percussion musicians, joined together in 1990 for the pleasure of performing as an ensemble. Many of the members have played with the Sacramento, Camellia and other symphonies, as well as with notable military bands. Talented musicians are given the opportunity to audition should vacancies occur. The group has performed in concert halls, parks and other venues throughout the Sierras and Sacramento Valley. The Winds are well-known for their varied musical repertoire, and they particularly delight in performing works by contemporary composers. The Winds is registered as a non-proﬁt corporation and is managed by a board of directors. It is funded through dues paid by the members, as well as donations and concert revenue. Sierra Nevada Winds is Awarded the Sudler Silver Scroll! This honor is awarded by the John Philip Sousa Foundation, and is considered North America’s most prestigious award for Community Concert Bands. According to John Philip Sousa Foundation, the purpose of the award is to identify, recognize and honor those community bands that have demonstrated particularly high standards of excellence in concert activities over a period of several years, and which have played a significant and leading role in the cultural and musical environment in their respective communities. We are excited and honored by this award and offer our sincere thanks to the Foundation for their consideration and acknowledgement of our work! We also thank our outstanding conductor, Robert Halseth, for his musicality and excellence in leadership. Robert Halseth was appointed Conductor and Music Director of the Sierra Nevada Winds Orchestra in 2011, following several years as rehearsal conductor, guest conductor, and co-conductor with William “Bill” Hill, who now holds the honorary title “Conductor Laureate.” Since 1993, he has been Director of Bands and Professor of Music at California State University, Sacramento, where he conducts the Symphonic Wind Ensemble, teaches conducting, and is the host/co-clinician of the Sacramento Summer Wind Conducting Workshop, now in its 19th year. For 17 of the past 19 summers, “Dr. Bob” has also worked with young musicians at Donner Mine Music Camp or Cazadero Fine Arts Camp. He earned two music degrees from California State University, Fresno, and a doctorate in conducting and brass pedagogy from the University of Northern Colorado, where his primary professor was Eugene Corporon. He has led ensembles at all levels – elementary through professional – including numerous guest appearances in the United States and abroad. 2013-2014 marks his 50th year of teaching. Previous positions include classroom music teacher in Fresno, band and orchestra director in the public schools of Oceanside, California, and faculty positions at Carroll College (WI), University of the Paciﬁc (Stockton, CA), and Sacramento State. During his 40 years as a professional bass trombonist, he held memberships in the National Repertory Orchestra, San Diego Symphony, and performed with the Fresno Philharmonic, La Jolla Symphony, Milwaukee Ballet, Stockton Symphony and Bay Bones. He has played hundreds of concerts, operas, musicals, dances and other “gigs,” appearing with such notables as Beverly Sills, Norman Treigle, Pierre Fournier, Bob Hope, Vic Damone, Diahann Carroll, Frankie Avalon, Bobby McFerrin, Cab Calloway, Johnny Mathis and Manhattan Transfer, and under the batons of Arthur Barnes, Paul Vermel, Zoltan Rozsnyai, Piero Gamba, Walter Herbert, Merle Evans, Thomas Nee, Peter Jaffe, Shari Lewis and Arthur Fiedler. Professional memberships include CMEA/NAfME, WASBE, Phi Mu Alpha Sinfonia, Pi Kappa Lambda, CBDA, and he is a Past President of the Western Division of the College Band Directors National Association. He has four children, two step-children, three grandchildren, and joyfully resides with his wife, Helen, also a musician in the Sierra Winds, in Gold River, California. In acknowledgement of his many years of outstanding leadership, commitment, contribution, guidance, and friendship to the Sierra Nevada Winds, the board has appointed William “Bill” Hill as Conductor Laureate. Bill Hill received his Master of Arts degree in Music Education at California State University, Sacramento, and has taught music in Idaho and California to students of all ages. Hill served as president of the California Band Directors’ Association and the Capitol Section of the California Music Education Association. He was honored as the ﬁrst recipient of the Outstanding Music Educators’ Award from the California Music Educators, Capitol Section. He also received the California Band Directors’ Distinguished Service Award and the Sierra College President’s Award. 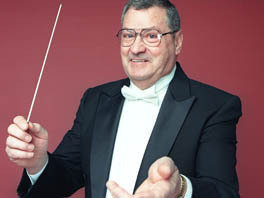 After 12 years as Director of Bands at Sierra College, Hill retired in 1992. He remains active as a music educator, serving as co-director of the Donner Mine Music Camp. He is in demand as a guest conductor, clinician and adjudicator. Hill and his wife Colleen reside in Newcastle. They are very proud of their ﬁve children, eleven grandchildren and three great-grandchildren. The Sierra Nevada Winds Orchestra provides its audiences with high quality performances featuring the ﬁnest traditional and contemporary wind ensemble music. Programs are chosen to educate, stir the spirit and provide emotional and intellectual gratiﬁcation for both musicians and listeners. Music on The Divide of Georgetown, CA is thrilled, once again, to host the Sierra Nevada Winds for our annual Septemberfest next Sunday, September 13 at the Garden Valley Park, Garden Valley starting at 4 p.m. Last year they brought us a Powerful Patriotic Program that brought the audience to their feet many times. It was just wonderful. Sierra Nevada Winds has performed for Music on the Divide well over a dozen times since 1990. Thank you! !